This is the wax figure of King Sejong in Seoul 63 Wax Museum of South Korea. 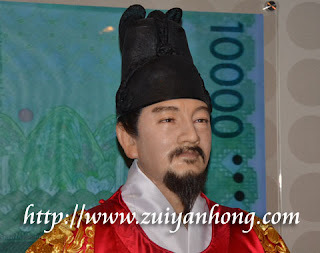 King Sejong was born in 1397 and died in 1450. At the age of 21, he was crowned as the fourth king of Joseon Dynasty of Korea. He had ruled Korea for over 30 years. During his reign, he implemented Korean character which is known as Hangul. Koreans are proud of their great ruler, King Sejong of Joseon Dynasty.